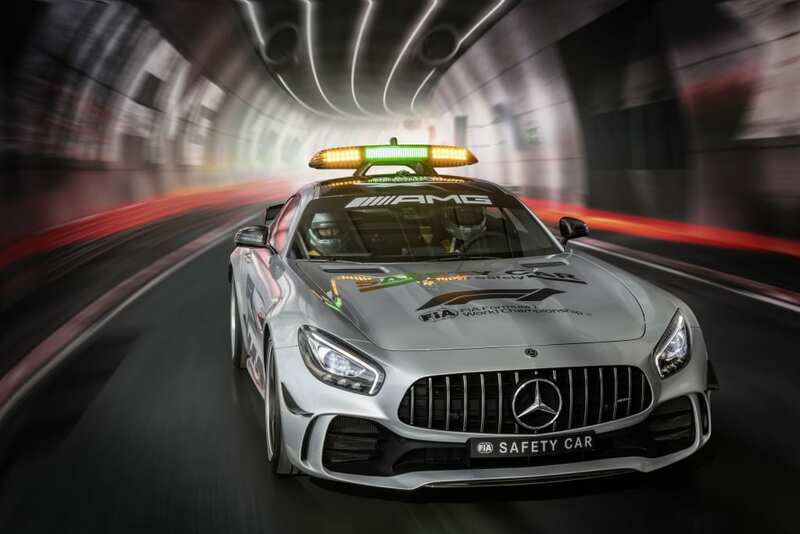 The AMG GT R had its debut as the Official FIA F1 Safety Car of the FIA Formula 1 World Championship at the Melbourne Grand Prix, from 22 to 25 March 2018. The top-of-the-line model of the AMG GT series ensured maximum safety for the Formula 1 field on all 20 race weekends. The performance and sports car brand from Affalterbach has supplied the pace car in the premier racing series of international motorsports since 1996. With an output of 430kW and a top speed of 318 kph, the AMG GT R is the most powerful and fastest Official FIA F1 Safety Car of all time. In this, the 23rd consecutive year, Mercedes-AMG will safely lead the Formula 1 field around the track when bad weather or accidents require its deployment. The AMG GT R is the ideal Official FIA F1 Safety Car, with the driving dynamics of the AMG GT3 racing car and having spent a large part of its development time in the “Green Hell” of the Nürburgring. “I was very much looking forward to my new company car. It is an absolute highlight in terms of driving dynamics and is one level higher up than the AMG GT S of recent years. Of course, ideally the safety car should be deployed as rarely as possible – but when we have to safely bunch up the Formula 1 field and lead it around the track, we will be superbly equipped with the AMG GT R”, says Bernd Mayländer, who is again the driver of the Official FIA F1 Safety Car in the new season. Never before has Mercedes-AMG packed so much motorsport technology into a production vehicle as into the AMG GT R. The front-mid-engine concept with transaxle, the powerful 4.0 litre V8 bi-turbo engine, the elaborately designed chassis, the sophisticated active aerodynamics and the intelligent lightweight construction lay the foundations for an especially dynamic driving experience. Wide front and rear wings allow an increased track width for optimum grip and even higher cornering speeds. The front apron with AIRPANEL active air control system and the active aerodynamics profile in the underbody, the large rear aerofoil and the rear apron with double diffuser increase the aerodynamic efficiency and help ensure optimum grip. The lightweight forged wheels are likewise designed for maximum driving dynamics. The same applies to the active rear-wheel steering, the nine-way adjustable traction control system and the adjustable coil-over suspension with additional electronic control.